Place all seasoned chicken in a pot. Cover with a sliced onion. Add Water. Bake in a 325 degree oven until tender. 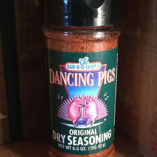 Heavily sprinkle Dancing Pigs Dry Seasoning on your meat. 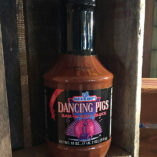 This recipe was featured on www.foodnetwork.com for the Bobby Flay Show on Bar-B-Q Specialties, which aired Summer 2004. Cook Pasta for 15 minutes & drain. Rinse in cold water & drain. Stir Occasionally. Cook for 30 minutes slowly. 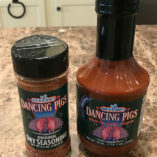 Pour Bar-B-Q Base Sauce over Pasta & stir. 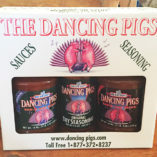 Dice up Pork Shoulder with each serving to put on top. Brown short ribs of beef in a oven at 400 degrees for 15 minutes on both sides. 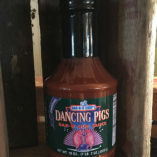 Mix 1 Cup of Dancing Pigs Original Bar-B-Que Sauce with 1 Cup of Water. Cook until tender in a oven at 325 degrees.